From this point on, every action is loaded with foreboding. Her antipathy reaches a peak when she encircles their beach in barbed wire to prevent the local people walking across it. When J begins logging the trees on his plantation in order to raise capital it seems as if his dream of an idyllic existence in the country has died. The novel becomes a catalogue of their misfortunes, with happier moments harder and harder to come by. Their relationship is increasingly strained and, though the death may be difficult you predict, a happy ending is unlikely. While I can’t claim to understand this, it is quite effective in a novel that has up to this point been very careful to avoid abstraction. It certainly conveys a sense of the sea outlasting human endeavour – and in particular the hubris of J. This unchanging nature is reflected in the novel’s characters too – neither J nor Elena can adapt to their new life; the local people cannot adapt to them. The death itself, it could be argued, arises from a refusal to change, or accept change. 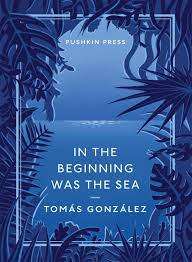 In the Beginning Was the Sea is an intense, claustrophobic novel which keeps the reader at arm’s length from its characters, perhaps reflecting the displacement Elena and J feel. Its story is intentionally predictable, but lacks much in the way of psychological insight to balance the fact that we know where we are heading. How you respond to it may depend on how you respond to Gonzalez’s pessimistic vision. This entry was posted on March 21, 2015 at 12:58 pm and is filed under Independent Foreign Fiction Prize 2015, Tomas Gonzalez. You can follow any responses to this entry through the RSS 2.0 feed. You can leave a response, or trackback from your own site. I’ve been looking forward to review of this one as I’ve enjoyed other novels from Pushkin Press (albeit the older classics). I’m left with the sense that you would have liked to learn more about J and Elena’s history, more insight into their past lives. Would that be fair? Possibly a little too claustrophobic for me right now, even if the cover is a thing of beauty. Speaking of Pushkin, I do want to read more Inoue – on the wishlist for when I’ve finished my twenty. *looking forward to your review..
I’m not quite sure what more I would have liked. The dice seem loaded against J and Elena from the start and rather than seeming hubristic or even overly idealistic, J seems feckless and Elena simply moody. Well, it is possibly the shortest (either this or The Dead Lake), so that may sway you in its favour! And they say size doesn’t matter! I enjoyed this one – as long as the reader doesn’t mind too much that Gonzalez doesn’t really do much in the way of suspense then I think it’s a good story with a very evocative setting. I think the setting is conveyed well – it’s the type of novel that fully deserves being described as atmospheric. However, I was never quite sure what, if anything, I was to make of the characters! This sounds rather good. I like atmospheric books, even when they are claustrophobic. For such a short book, it does feel heavy with doom. It is a gorgeous cover, Jacqui’s quite right about that. I’m actually rather tempted by this one. The sense of claustrophobic inevitability and the seeming critique of a certain kind of colonialist attitude. Thanks. Whether it’s a colonialist attitude, or a pseudo-intellectual one, or simply one of privilege, it stands little chance in this novel! I just reviewed this at mine, and like you had some issues with lack of psychological depth – particularly with relation to Elena. Claustrophobic is a word that fits it well I think. I’ll have a read of your review now I’m back from holiday. I seem to recall others on the shadow IFFP jury loved it more than me!